Adding four new digital billboard faces is part of Las Vegas Billboards' campaign to expand its presence and broaden its reach for local and national advertisers. Las Vegas Billboards has grown by eight digital billboard faces this year. LAS VEGAS - Sept. 14, 2018 - PRLog -- Las Vegas Billboards LLC (LVB) recently acquired two digital panels and converted both sides of a static billboard to digital, adding four high-profile digital billboards. The expansion gives the company 24 digital billboard faces within the Las Vegas market to complement its traditional static inventory. This most recent purchase completed LVB's acquisition of Las Vegas-based Resort Media Partners' billboard assets and solidified LVB as Nevada's largest independent local family-owned digital billboard company. LVB has acquired six digital panels from Resort Media Partners. 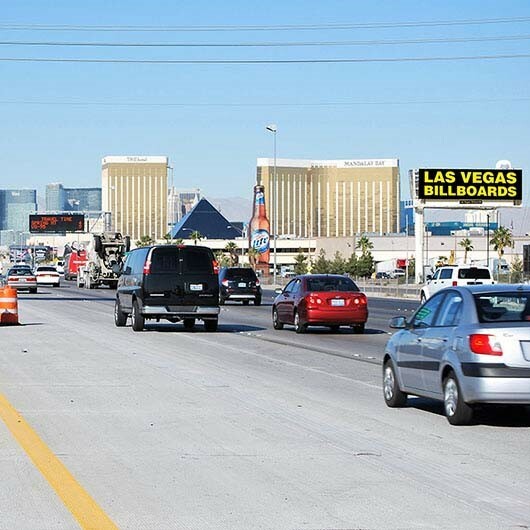 North U.S. Highway 95 at Vegas Drive (north face) — Converted static billboard to digital in northwest area of Las Vegas, a long stretch of freeway with limited billboards. North U.S. Highway 95 at Vegas Drive (south face) — Targets drivers headed to Summerlin and Aliante, Best In The West Shopping Center and MountainView Hospital. Interstate 15 south at Sunset Road (north face) — This board, on the Shelby Car Museum property, is just north of Town Square in a heavily trafficked area leading to McCarran International Airport and 215 Beltway interchange. Targets drivers headed to Henderson/Southern Highlands and Southern California. Interstate 15 south at Sunset Road (south face) — The last right-hand-read digital billboard before the tourist corridor/Strip and new stadium for the National Football League's Raiders. "The new acquisitions and development expand our reach in northwest Las Vegas. They will add depth to our I-15 inventory with this new location just 1 mile south of the Raiders' stadium," Las Vegas Billboards owner Chad Harris said. "Las Vegas is a fast-growing community with a booming economy, and now we reach drivers headed to the new residential areas, medical centers and retail developments." "We've grown our company by eight digital faces already this year, and we expect continued growth," Harris added. Gabe Oliverio, managing director at Johnsen, Fretty & Co., the Stamford, Connecticut-based investment banking firm that represented and advised LVB, said, "Chad and his team have done an extraordinary job of acquiring select billboards and turbo-charging their performance. It also helps to have a Las Vegas economy that seems to be firing on all cylinders." Las Vegas Billboards LLC, (www.lasvegasbillboards.com) has served the Las Vegas Valley proudly for more than 30 years and was an early Las Vegas pioneer of digital billboards, an environmentally friendly alternative to static billboards. LVB, a boutique billboard company, stands out by working closely with each client from start to finish. LVB provides advertisers with 10 seconds of viewing time per image on digital billboards (20 percent to 30 percent more ad time than the Las Vegas industry standard) and offers in-house graphic artist services and approved images can be uploaded to a digital billboard within minutes. LVB, founded in 1987 by U.S. Army veteran Dave Harris, is now operated by his son Chad Harris, a board member of The Public Education Foundation, which seeks to improve education for Nevada children. About Johnsen, Fretty & Co.
JFC (www.jfco.com) is the leading investment banking firm to the out-of-home media industry. For more than 25 years, JFC has advised out-of-home operators across North America on divestitures, acquisitions, raising financing, strategic partnerships and valuation. JFC has completed more than 300 out-of-home transactions in that span.